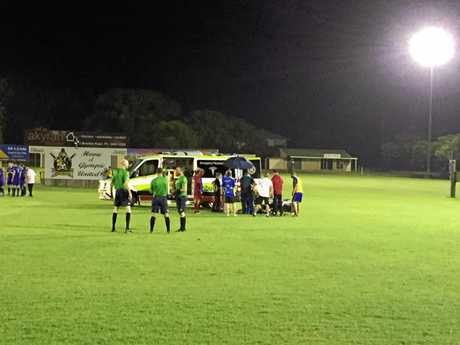 Gladiators player-coach carted off field after 'freak' injury: Kyle Nix's night comes to an early end against Nambour Yandina United. 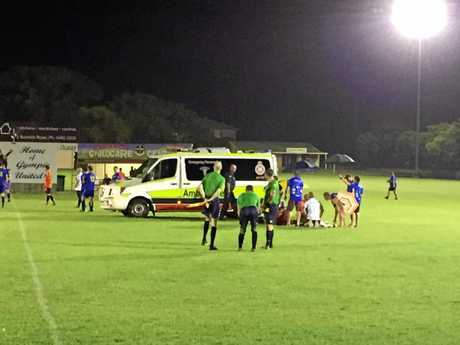 SOCCER: A Billy Bayldon double gave Gympie United a valuable draw with Nambour Yandina United in a wild derby that also saw player-coach Kyle Nix taken from the field in an ambulance on Saturday night. 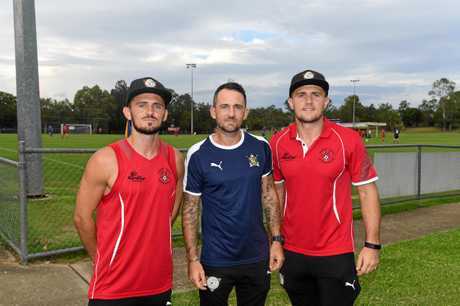 Inserting himself into what was pitted a rivalry game against brothers Korey and Kallum, Gympie's Nix lasted just 30 seconds on the pitch with two minutes remaining before an opposition player's tackle left him with a sickening dislocated elbow. 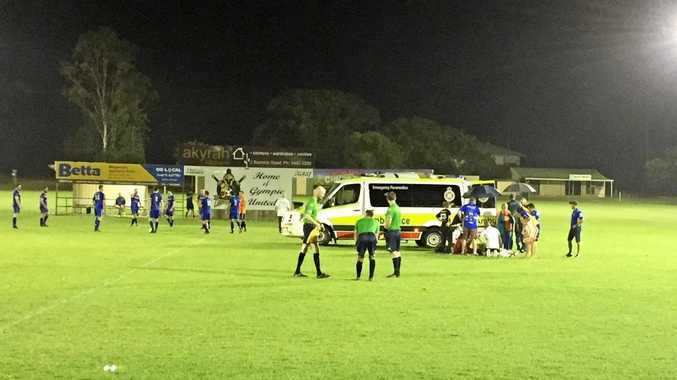 Play was stopped and a stretcher called on to the field as the Gladiators' boss of two years writhed in pain. Nix seemed to take the injury in his stride, calling it a "minor setback” on his Facebook page on Sunday. And it was one which may not have even happened if not for a split-second decision. He did though, and shortly after found himself on the receiving end of a "freak accident” which caused "the worst pain I've ever felt in my life”. Fortunately the Gladiators offered up their own anaesthetic for that pain. He is not going to dwell on the injury, either, although the full extent of the damage was still unknown thanks to the swelling. His injury was not the only sequence one of the Nix brothers found themselves at the centre of, an earlier altercation in the "scrappy” affair leading the referee to issue Kallum with a red card and ending the NYU man's night prematurely. 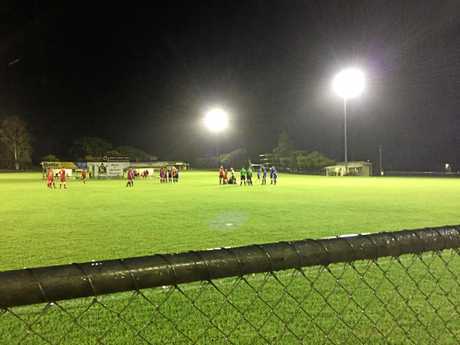 Coming off a 2-0 defeat to Caloundra last week, the Gladiators began positively but found themselves on the wrong end of another 2-0 scoreline at the half time break. Bayldon wasted no time slicing the deficit in half after the main break, capitalising on his side's positive build-up play to slot the ball home from the edge of the box. Tensions heated up as the Gladiators hunted their elusive second goal with increasing desperation, as "plenty of tackles” hinted a potential boilover between the fierce rivals. Entering injury time with the threat of another defeat at the final whistle, Bayldon proved the hero when he beat the Reds' keeper a second time and handed his side a valuable point on the McDonald's Premier Men table. Kyle said he was happy with to draw with a team he expected to be in the running for a top four spot this year. Gladiators president Joel Albion said the home game had been strongly supported. Football returns to the Gladiators' home deck this Saturday as they look to advance in the FFA Cup.